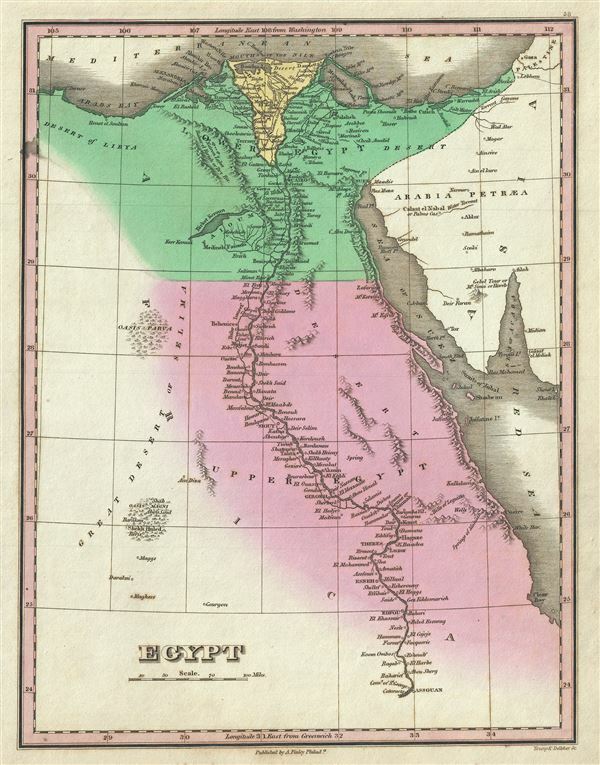 This is a beautiful example of Finley's important 1827 map of Egypt. It depicts Egypt, centered on the Nile River, and extending south as far as Aswan and names numerous settlements and villages along the course of the river, including a number of temples and ancient Egyptian ruins. Also identifies several desert Oases including Parva (Kharga?) and Shekh Huled (Dakhla?). In the Sinai Peninsula, a mountain labeled 'Gebel Tour, Mt. Sinai or Horeb' is drawn. This map was drawn shortly following the expulsion of the Napoleonic forces from Egypt by the Ottoman Mamluk Turks. Muhammad Ali, the Ottoman commander who was named viceroy of Egypt established the Mamluk dynasty that would rule Egypt until the Egyptian Revolution of 1952. Between 1820 and 1833, Ali annexed northern Sudan, Syria and parts of Arabia into the Mamluk Empire. The map is engraved by Young and Delleker for the 1827 edition of Anthony Finley's General Atlas. Finley, A., A New General Atlas, Comprising a Complete Set of Maps, representing the Grand Divisions of the Globe, Together with the several Empires, Kingdoms and States in the World; Compiled from the Best Authorities, and corrected by the Most Recent Discoveries, Philadelphia, 1827. Very good. Overall age toning. Minor spotting. Original platemark visible. Rumsey 0285.059 (1831 edition). Phillips (Atlases) 4314, 760, 752, 6045.